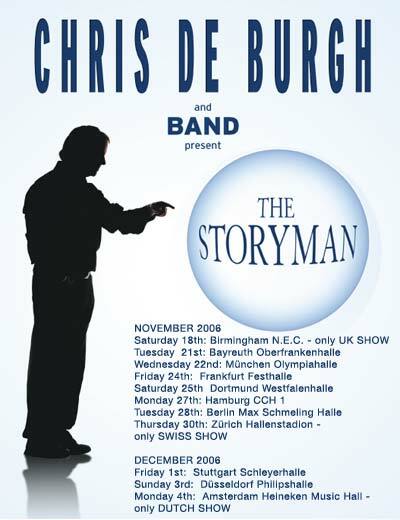 A unique ability to communicate with his audience has sustained Chris de Burgh at the peak of the music industry for the past 30 years. His success has been largely based on a very personal relationship with his fans, especially in the live arena. His power and strength in telling stories has crossed language and cultural barriers around the world. His latest project, ‘The Storyman’, is inspired by the many compelling songs which have connected so deeply with his listeners. Commencing in 2006, this special, limited series of concerts will find Chris reunited with his band for performances encompassing his epic material from the past - alongside new stories yet to be told. Birmingham, UK, NEC - only UK show!